Location, location, location! When photographing a destination wedding, we will always spend time scouting the area in search of unique locations that provide a true sense of place. 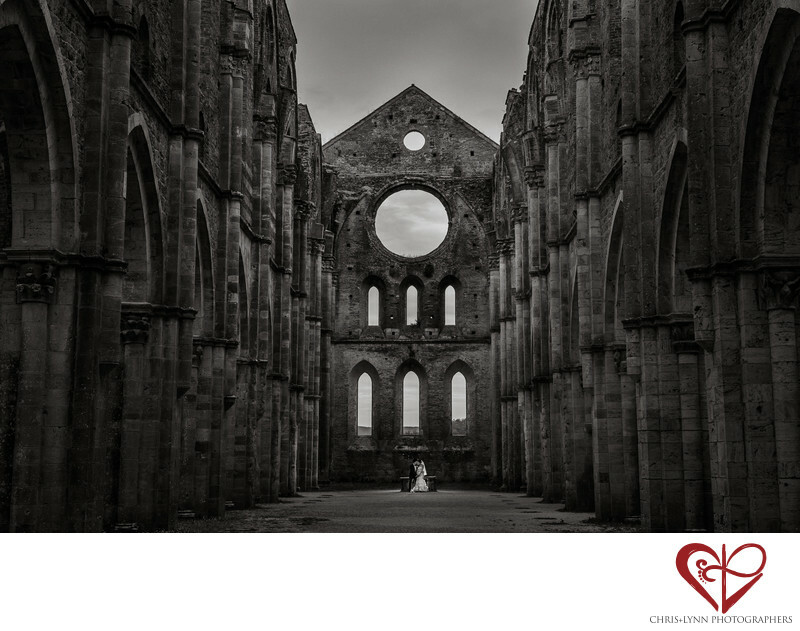 These dramatic ruins of a medieval church was an hour away from the couple's ceremony site so we did a bride+groom portrait session two days after their wedding. The pillars, arches, and overall grandeur made this an inspiring location. It was also meaningful to the couple; having a spirit of adventure while traveling to new places was a theme to their wedding. It was the groom's first trip to Europe and the couple set up exploration tours of the area for their 50 guests - all of which we photographed. After four days of travel with them, we felt like family! To read more about this incredible Florence destination wedding, please see Robin & Gary's feature wedding story on the Style Me Pretty wedding blog. "Some of my favorite memories from our destination wedding were the anticipation of getting ready and spending time with my maid of honor; taking photos on the streets of Florence, exploring the countryside of Tuscany in a vintage convertible, and our post-wedding portrait session with our photographers at the Abbey of San Galgano. It was a great adventure!" As wedding photographers, nothing makes us happier than to hear that several of Robin's favorite wedding moments are from her photo sessions with us! View this couple's Italian destination wedding at Villa La Vedetta in Florence in the featured weddings section of our website here. 1/320; f/7.1; ISO 400; 50.0 mm.